It has been a decade since the historic crash-and-burn of Las Vegas and its most important industries. The Great Recession stomped into America’s most popular playground in 2008 and shattered the Las Vegas dream into tiny pieces. The city’s housing market quickly became one of the biggest catastrophes of the real estate bubble burst, thousands of jobs were cut, visitor numbers tumbled down, and ambitious construction projects were halted in hopes for better times to come. Several years later and some 7,300 miles westwards, Macau, which had previously emerged as the world’s largest casino gambling hub in terms of casino revenue generated, became one of the main targets of a massive anti-corruption campaign led by Chinese President Xi Jinping. The unprecedented crackdown on illicit flow of money to and from Mainland China and on widespread corruption across the political and business spectra of the country quickly took its toll on the small enclave, which was and still is the only Chinese territory where casino gambling is legal. Macau saw a quick and dramatic drop in gross gaming revenue as a result from the massive withdrawal of VIP players from its casinos. While the Great Recession showed Las Vegas that all its leading industries were the first to be hit in cases of serious economic shocks, the anti-graft campaign of President Xi made Macau realize just how heavy its reliance on wealthy Chinese casino players was. The past two years have been of critical importance to both Las Vegas and Macau. After several years of struggles to stabilize their casino industries and hopefully bring their key performance indicators at least close to pre-recession and pre-corruption crackdown levels, latest figures from their local regulators show that recovery may be on the way. Casino News Daily has compiled a detailed report on the state of Las Vegas and Macau’s casino industries, based on information released by the Nevada Gaming Control Board and the Macau Gaming Inspection and Coordination Bureau and on trends that have occurred in each of the two cities’ gaming industries over the past several years. The report is accompanied by an infographic to provide context through illustration. 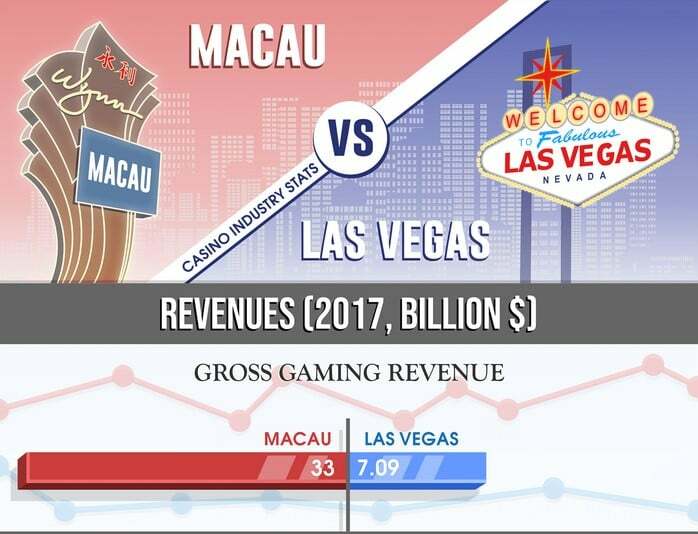 The infographic shows that Macau was well ahead of Las Vegas in terms of annual gross gaming revenue even back in 2007, when the latter city recorded its all-time high GGR. Here it is important to note that the report and the accompanying infographic contains revenue information about the casinos located in Downtown Las Vegas and the Las Vegas Strip, and does not include information about other casinos spread across Clark County. Information obtained from the gambling regulators of the two cities showed that they have been targeting different customer groups. As mentioned above, Macau is heavily dependent on VIP players who prefer table games to any other form of gambling offered at casinos. On the other hand, Las Vegas generates a bigger portion of its revenue from slot machines. It is also important to note that while slot machine revenue accounts only for a fraction of Macau’s annual gross gambling revenue, in Las Vegas the percentage of slot machine revenue accounts for 51% and table games proceeds represent 49% of the total gaming revenue. Another important thing to take into account is the fact that Macau’s annual visits numbers are significantly lower when compared to the number of visits in Las Vegas. However, while a great portion of all Las Vegas visitors are flocking to the city’s non-gambling facilities, the average Macau visitor is a high roller casino player who is mostly interested in the city’s gambling offering. Diversification, expansion, and renovation are the three approaches that both Las Vegas and Macau believe would help them to recover from their individual struggles and hopefully avoid any similar experiences in future. The next few years will be of critical importance to both cities as they will show whether Las Vegas and Macau have learnt the lessons of the past or are still failing to uncling from the things that had previously crashed their gaming industries.